Oberthur Technologies has deployed its FlyBuy contactless stickers to three banks internationally, including one of the largest card issuers in the United States. The sticker is the latest product in Oberthur Technologies’ development of contactless payment and form factors. Approved and developed in cooperation with MasterCard, Oberthur Technologies’ FlyBuy Sticker is a contactless payment device that can be attached to any surface including a mobile phone, PDA, MP3 player or key ring, enabling the end user to choose their very own personalized payment device. To pay, the user simply needs to place the device with the Sticker attached in front of the contactless reader. It can be used as a normal payment card at any Point-of-Sale terminal accepting contactless. Tested in pilots internationally, the FlyBuy Sticker is designed to work with existing business models, and can be personalized on any standard contactless equipment. 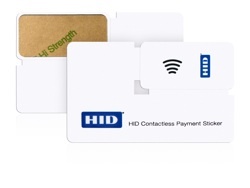 Oberthur has five financial institutions buying the stickers, Martin Ferenczi, managing director of the Americas Region for the Card Systems Division of Oberthur Technologies, tells ContactlessNew.com. But banks may not be the only customers, Ferenczi says. Oberthur is targeting public transportation groups as customers as well.